Best Ukuleles | Gear Acquisition Syndrome!! … and the smiling sound of a UKULELE sweeping down the beach from somewhere in the distance. What is it about this tiny, unassuming instrument that can so take us to the peaceful, embracing beauty of the islands in just an instant?! Who knows? But you’re here, so that means… you’ve decided to find out! You’ve drunk the sunny KoolAid and are decisively UKE-bound and strum ready. But which ukulele should you get? I mean, one cursory look online and you can see… there’s a TON! Good question! If you missed my first post about how to buy a ukulele, you’ll want to go check that out first HERE. There you’ll find lots of info and get a good understanding of how to proceed in your ‘great island quest’ for a uke. 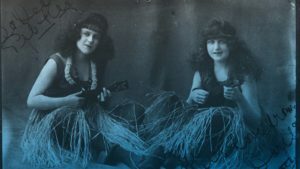 If you did read it tho’, let’s now move on to the 7 best ukuleles that you can get RIGHT NOW to fan that Hawaiian beach party flame into a roarin’ BONFIRE!! The ukulele is no new instrument. It’s been around since the 1880s in Hawaii. For some reason, this little “jumping flea” (what ukulele translates as!) really caught on in America. Just check out those classy early 1900s gals playing for your listening pleasure. They got uke fever BAD! But clearly today there are more manufactured ukuleles worldwide than EVER before. But there’s no need to get mired in uke overload. Every year we do a thorough scanning of the industry to see what the best values are at different price points… so you don’t have to! So off we go!! We’ll start with the cheapest. 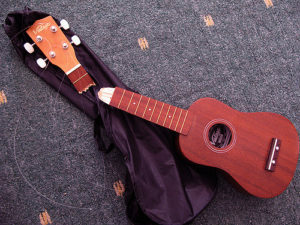 Now, sure, you could the least amount possible to get a ukulele (like THIS PAPERWEIGHT), but you’ll be disappointed when, not only will it probably fall apart within a few times playing it, it might not even make it to your DOOR in one piece! Not to mention they’ll be hard to play, are often missing crucial pieces (plenty of reviews saying that!) and sound pretty pathetic. 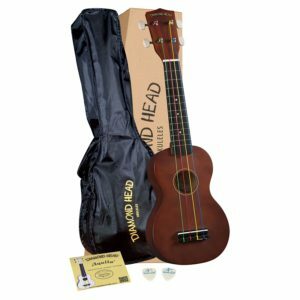 1) The Diamond Head DU-151 Soprano Ukulele Starter Kit! 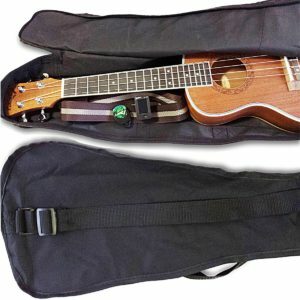 This not only has a decent uke that has garnered 4 out of 5 stars in over 700 reviews, but it also comes with a gig bag, a pocket instruction guide, an online lesson, and even picks. This ukulele is a rare product. Why? It’s one of the very few products I’ve ever seen that has over two thousand reviews all giving it a FIVE-STAR RATING! Pretty outstanding. 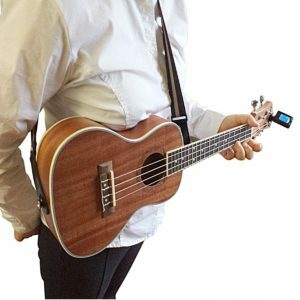 FREE Bonus Ukulele Video Lessons! 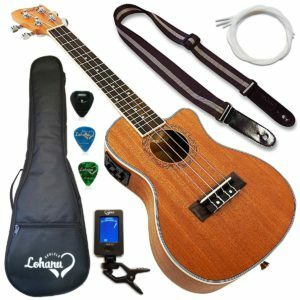 UNCONDITIONAL LIFETIME WARRANTY for Ukulele & All Accessories!! To get all that for under $80 is quite the accomplishment. Plus it looks really, really nice. That Mahogany wood grain looks killer, and rivals the look of my own mahogany uke that cost over $200!! if you’re serious about gettin’ your hula on, why wait… BUY IT HERE! 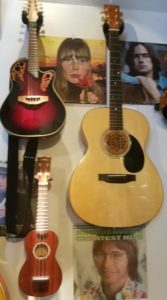 Both of the ukes above are Soprano ukuleles. They are almost the smallest available. But what if you have larger hands?? No problem! Lucky for you, the Lohanu Ukulele package ALSO comes in a Concert and a Tenor size! The most common uke played today is a “Concert Ukulele”. It’ll provide you with a little more real estate under those fingertips and won’t make you feel quite so much like your hands are having to play “Twister”. All the specs of this uke are the same as the Soprano above. You’re basically just getting a BIGGER instrument made of all the same materials… at the same insanely low price. Ready to get that fingertip upgrade and bring the island breezes to your porch by getting this Lohanu Concert Uke? BUY IT HERE!! Got REAL “monster mitts”??! Then I’d instead increase the size even further and go with the Tenor size. As you increase the size of the instrument, the space between frets increases, thus giving you more room to maneuver. The Soprano, Concert and Tenor ukuleles all have the same fingerings. It’s only when you move down to the Baritone uke that the fingerings change. So feel free, as many of my uke-y friends have, to get one of each. I did have one of each… until I traded away my Tenor for… a Telecaster guitar. If you’ve got cocktail wieners for fingers, Lohanu has you covered – celebrate that size matters and get your larger-sized Tenor ukulele today. To nab it, CLICK HERE!! First off, I have to put in this list one of my favorite ukes to play, and that’s the BARITONE ukulele. If you’re coming from guitar to uke, guess what? You already know the fingerings! Playing a baritone uke is just like playing the upper four strings of a regular guitar in standard tuning. 5) The Oscar Schmidt OU53S Baritone Ukulele! Dimensions: 14″ (35 cm) long, 10″ (25 cm) wide at the lower bout, 7.5″ (18 cm) wide at the upper bout, and 3″ (7.5 cm) deep. I really like two things especially about this uke: the wider, more manly bridge, and the impressive detailing and purfoiling that is done on the edges. Beautiful stuff! GET IT HERE and start Bari-toning your way to the beach tonight!! 6) The Lohanu Cutaway Electric Concert Ukulele! When you get into the one hundred dollar PLUS range, you probably (like me) are also thinking about electrification. The best uke under $200 I could find that comes ready for amplification is this awesome deal. I need to say here, I am in NO WAY affiliated with Lohanu. I get no kickbacks from them, no percentage. I have never talked with them in my life. But I cannot ignore all the reviews people leave – not just dozens… HUNDREDS of reviews, almost all giving 5 stars to these products. Capitalism doesn’t lie, in this respect. These ukes are getting thumbs up all across the nation! Whenever I thought I found a good deal and good quality from another company, I find Lohanu blowing them away in the reviews section… and in their pricing. This is such an amazing deal, and proven to be such a quality instrument based on the reviews, I’ve decided that I’M buying one. Yep; I LOVE the fact that it’s a cutaway, which you rarely find in a uke under $200. Wanna join me in snatching up this stupendous value in a ukulele package? Easy – BUY IT HERE!! Okay, if you’re willing to spend upwards of $300 for a ukulele, you are definitely in the big leagues now! 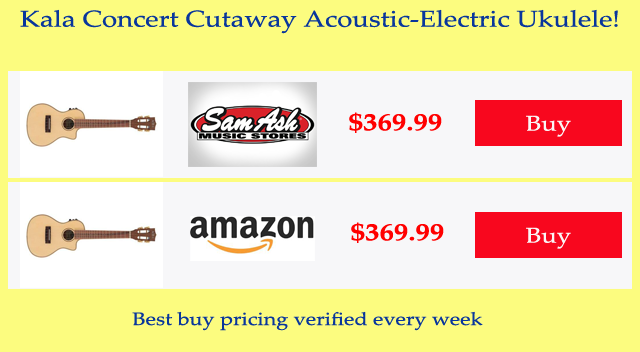 You obviously want an instrument that is going to sound good all the time, have excellent intonation, stay in tune, look phenomenal, and last for years. Am I right?? 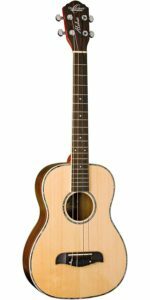 7) The Kala KA-SKCGE-C Spruce/Koa Concert Ukulele! Look at that Spruce, goose! There’s one large reason I am recommending this particular ukulele – the specific combination of woods used in its construction. See, I had a guitar made from scratch by a luthier who knows his picks from his pickups, and we were very deliberate about choosing the woods. I “listened” to quite a few different types of wood faceplates. By simply tapping on the thin wood top you could hear already, even before construction, how the wood disseminates sound. Adirondack Spruce was, by far, the best-sounding top plate I heard. The rest of the guitar I made of Hawaiian Koa. Today, it is my NUMBER ONE, go-to acoustic when I’m recording in the studio. Nothing beats it. I rarely have to EQ it at all. It’s just that good. This Kala ukulele is made of almost the same stuff. Similar woods mean similar tones, so this baby should give you a lot of sweet, sweet music for years to come. Kala is a very respected brand too. Someone very into ukes swears by ’em (you’ll meet Mark farther down!). This is obviously more of an Intermediate to Professional-type instrument. The Fishman electronics unit I have used myself. It’s also dependable, clean and effective towards getting a great sound through a P.A. system. 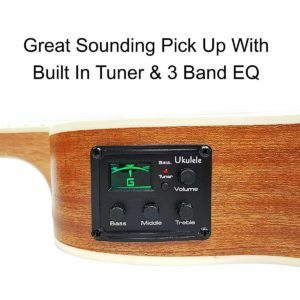 For more info, check it out on THIS PAGE, and start imagining what it would be like to speak through this kind of a higher-end uke. I can tell you… it’s GREAT! When the Hawaiian Sky’s the Limit! What’s left? Well, I don’t want to leave out those of you to whom a ukulele is more, so much MORE, than an instrument; it has become… for you, a way of life. I have a friend for whom this is definitely true: Mr. Mark Swarthout. 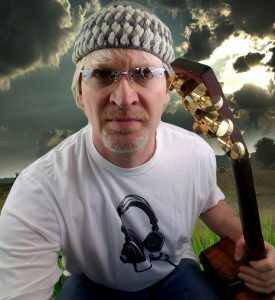 His website says it all – theukuleledude.com! 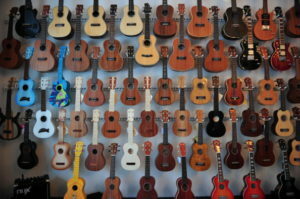 I mean, come on… just take a look, in the picture below, at all those ukuleles the man plays!! Talk about serious G.A.S.!! My Franks babies hangin’ in the studio (right & lower left)! Lastly, I have to also tell you about the luthier who hand-built my own soprano ukulele, Mr. Mike Franks. 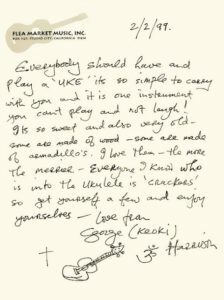 He’s become quite the renown builder of ukes and guitars; his instruments are now sold worldwide and he has a solid, loyal following that often buys multiple guitars from him frequently. To the right you can see the acoustic guitar and soprano ukulele that he constructed from scratch (as I got to watch!) and are without question two of the top instruments in my whole studio. THIS PAGE, on Mike’s website, shows you everything you need to know about why his renown has grown exponentially over the last few years. 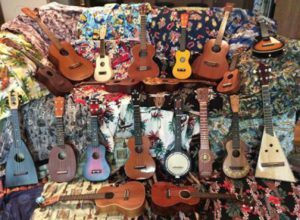 If you’re truly serious about a well-intoned, professional’s ukulele, by all means give his carefully handcrafted instruments a look. Time to Hula Down the Beach! You’re going to have BIG SMALL FUN with the friendly, smile-inducing ukulele, that’s a given. I know these insights and recommendations, based on my own experience and that of other professionals, will help you reach volcanic heights of musical exploration and creation. 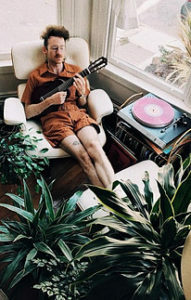 I’d like to give a BIG shout-out to my friend and adroit uke aficionado Mark Swarthout for giving us his insights that helped direct this post into the best pics for you at this point in time. Products change every year, but the options outlined above are excellent choices for you right now! I think we’d be wise to take his “sound advice”! I know I already have… for years now!! Now, go order that dream uke, get your nimble wrist ready for strummin’, and go… make… sounds!!! I have a cheap and a more higher end uke, the difference in weight, feel and tone of my cordoba is awesome. It sounds a lot richer with the spruce top and rosewood back and sides. 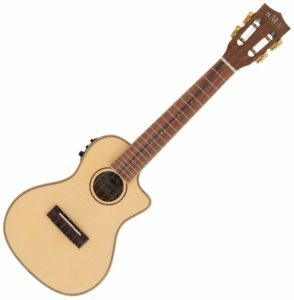 Have been keen to try out a baritone ukelele, different sound but would be a quick transition for a regular guitar player, would you agree?